Designer: Ian Anderson. Hull Builder : Colvic Craft, Witham. UK. Finished in Cyprus. Construction: Deck. Teak. Encapsulated fin keel. Superstructure. Glass fibre -balsa wood sandwich Interior Trim. Glass fibre teak lined interior. Exterior Colour Scheme: White with blue stripe. Mast and boom -Kemp. Running rigging –Kemp/Terry. Standing rigging -Kemp -s/s. Reefing main -Kemp. Fore -Furlex. Telescopic boom vang by Kemp. One emergency forestay with adjustable linkage. 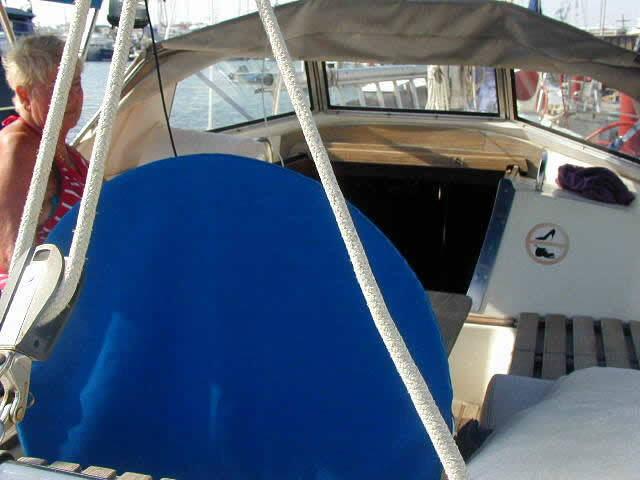 Suitable for storm jib or second genoa. Winches -Lewmar. Sails -3 Loucas -Main, 150% Genoa, Cruising Chute. Sail area. Main 195 sq. ft. Genoa 400 sq.ft. Engine. Yanmar 35 HMF fresh water cooled. Three cylinders. 34bhp. Fuel -diesel. Under 300 hours use. Connected to prop. shaft via an Aquadrive system. Yanmar gearbox. Morse- Yanmar controls. Maximum speed with engine 7.5 kts. Cruising speed 6.8 kts. Steering Vetus Hydraulic P55 pedestal. Fuel tanks 160 Lts. Water 350 Lts. Electrics. 12V- 240V (4 points). Automatic battery charger permanently connected to three domestic and one engine battery .Lighting, fluorescent + filament, comprehensive layout. Total number of berths 5- 8. Two heads. 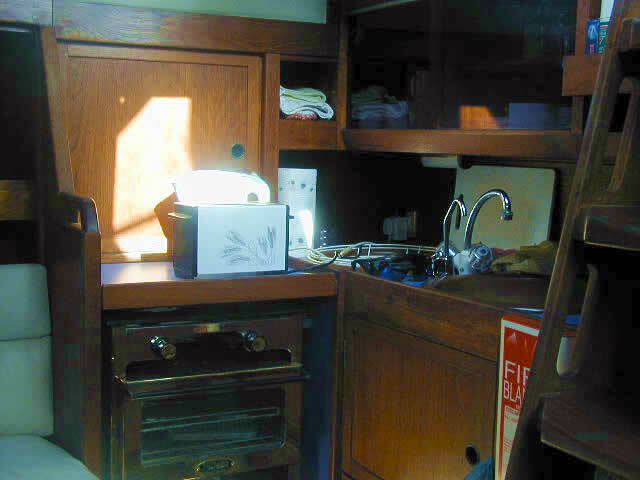 Fo'c's'le, two berths, fwd head with shower, WC, hand basin and cabinets. Saloon: Seats seven. Bar cabinet, kitchen work top, two sinks. Thermo cool electronic fridge/freezer. Navigators table and berth. 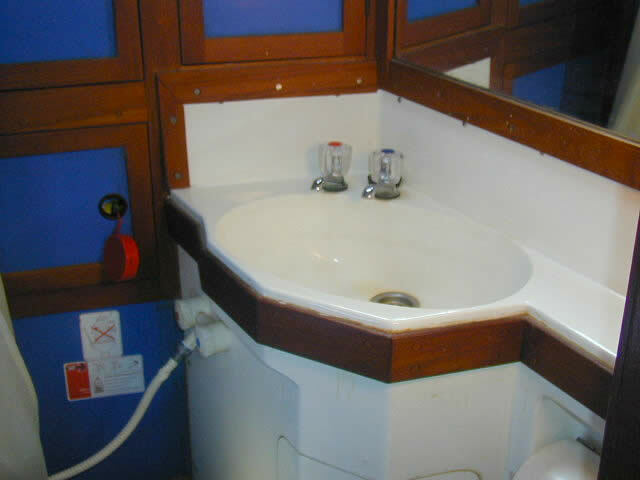 Aft cabin -double berth, WC, hand basin, closets and services room. 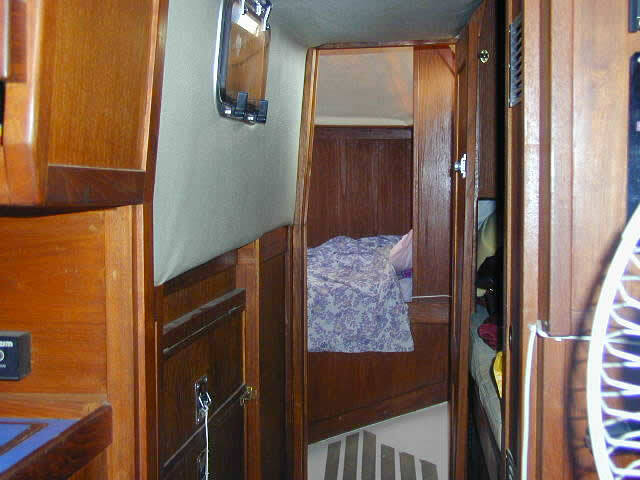 Both fore and aft cabins have doors. Radar (32 miles) Gold star, radar reflector, B & G Hunter, depth speed and log. Autopilot Autohelm 5000 with auxiliary controls and remote control. ICOM VHF , Garmin 120 GPS. Calorifier heated from engine or from immersion heater for domestic hot water, which is pressurised. Taylors top of the range Kerosene stove with two rings, oven and grill. Radio and tape player. Vetus davits. Yamaha 'Malta' outboard engine. Electric windlass with remote control. Fold down spray hood, fitted to solid glass, aluminium framed screen. Good quality bimini. 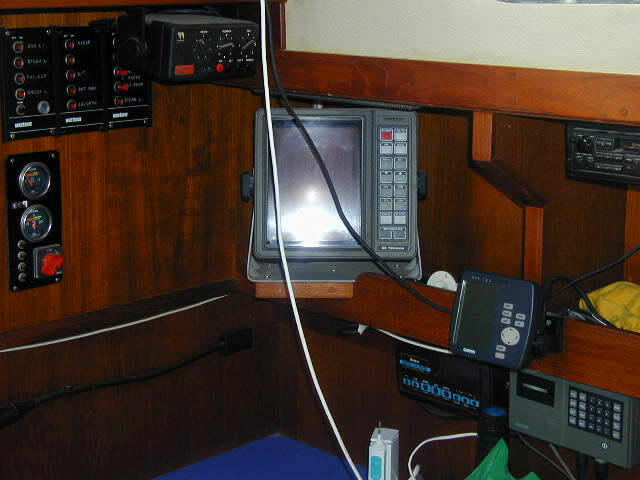 Automatic bilge pump, and a manual bilge pump in cockpit locker. Folding teak table in cockpit. High power searchlight. Complete set of manuals on all equipment, including a full engineering manual on Yanmar engine. Full engine overhaul kit, exhaust pipes, mufflers etc., and many other spare parts. 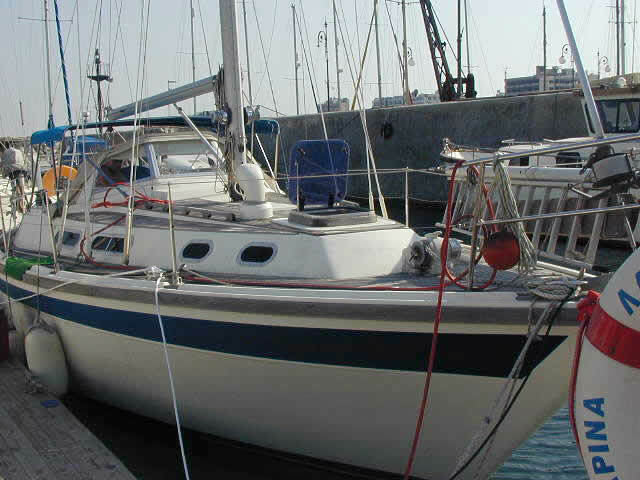 One Bruce anchor with 45m chain. One seaman anchor with plaited rope. 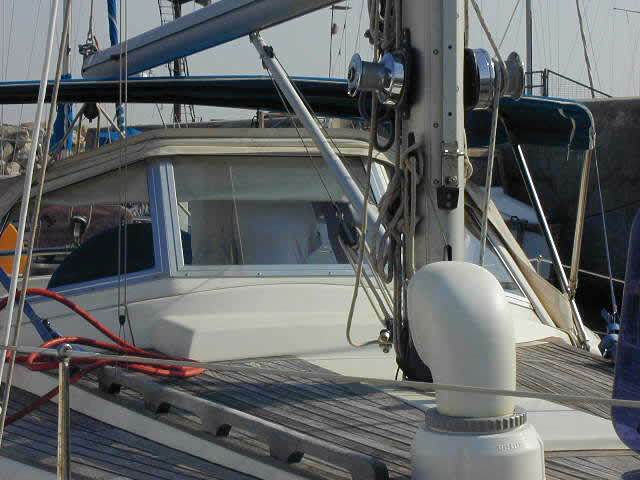 One folding aluminium anchor. One telescopic spinnaker pole. Two st.stl fender holders, with six fenders. One st.stl winch handle. One floating winch handle. Full set of dishes, plates, cups and bowls etc with cutlery set. Toaster and electric kettle. Mattresses: dense foam with zipped heavy duty luxury covers. Saloon seating, zipped, in soft white leather covers. Two bosun chairs. Filter installed for foot pump operated drinkable cold water supply. Pressurized hot and cold water supply. Osmosis treatment by the West System, guaranteed until 2005. This warranty is transferable to the next owner, and may be renewed by him for a further five years. 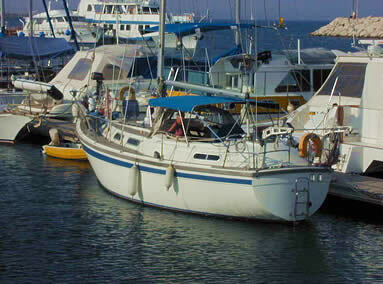 This boat is Cyprus duty paid. The marina fees are paid.